The Netflix original series DreamWorks Voltron Legendary Defender reimagines one of the most popular fan-favorite shows of all time in this all-new comedic action-packed show from executive producer Joaquim Dos Santos (The Legend of Korra, Avatar: The Last Airbender) and co-executive producer Lauren Montgomery (The Legend of Korra). Five unsuspecting teenagers, transported from Earth into the middle of a sprawling intergalactic war, become pilots for five robotic lions in the battle to protect the universe from evil. Only through the true power of teamwork can they unite to form the mighty warrior known as Voltron. Grab your Voltron Printable Coloring Pages here! 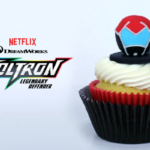 VOLTRON: LEGENDARY DEFENDER premiered exclusively on Netflix June 10th!! Enter to win this Voltron: Legendary Defender Prize Pack using the Gleam form below. While you are here, check out my other giveaways and GOOD LUCK!